This such a timely post! This is for me…. You hit the nail on the head when you said the enemy wants me to worry if God will do things on time!! I identify with what you have shared. So true! God’s timing is perfect. Thank you for this!!! Most all of us are guilty of impatience, especially these days! We live in an “instant” world. Faster internet service, faster work production, even faster drive-thru coffee/food! But God has His own time schedule and it is perfect, as He is perfect! As one of my very dear readers told me yesterday…”It’s okay, Steve, God has ‘got this!’ ” And He does…He has our backs in every situation and will not let us down, ever! Amen! I’ve been giving the evil one the boot a lot lately. Somehow I allowed my self to listen to his lies and I’ve started putting him in his place, behind me, again. Good for you, Shannon! It’s very easy to allow that “bad guy” to sneak up on us…man how I know it myself! Shannon reminds us of that God’s timing is perfect, always! I think the best biblical example of the impatience while God does something, is Aaron and Israelites creating a golden calf while waiting for Moses! They just experienced God in a huge way, and yet so quickly got impatient with having to wait! Yes, that is a great story to demonstrate patience. I often fear becoming like them. Your post read like a devotional…straight and to the point. 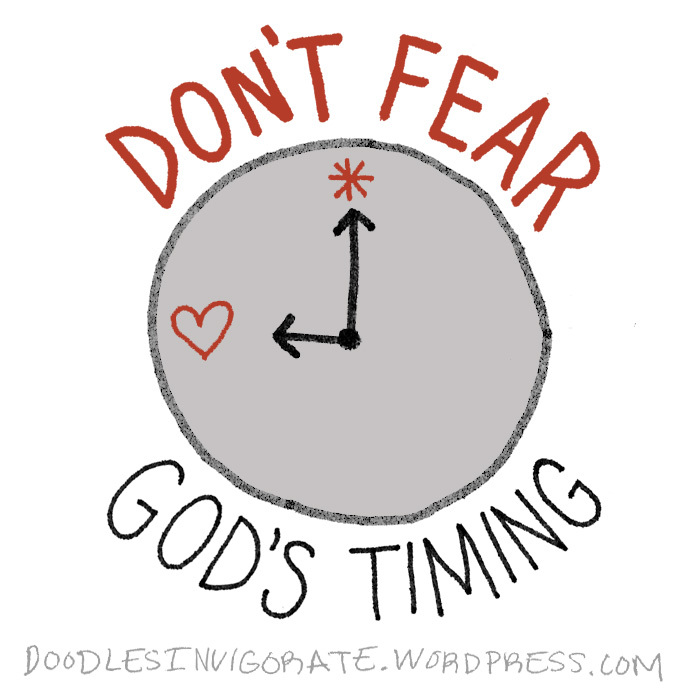 But, so true…don’t fear God’s timing. Things would go a lot smoother if we didn’t fear it. I just posted something today kind of along the same lines as this. God’s timing is perfect! And He is good all the time! !